Don Pierre Perignon spent 47 years of his life at Le Abbey de Hautvillers. And despite his countless monastic duties he found time to change winemaking forever. Fast forward 300 years and we find ourselves before the large, wooden doors of his abbey. We're in Champagne-Ardenne, home of the beverage the Dom is said to have invented. The vineyards that surround the abbey stretch for miles until they meet the Marne river. We may have come for the wine, but the view alone seemed well worth the trip. New laws ensure that produce exclusively from this region can don the Champagne label and that's largely thanks to the Dom's work. It was he, locals claim, who first introduced bubbles to wine. This story has been hotly contested, some would even say disproved,but don't broach the subject with locals. As a tribute, the region's most famous wine house Maison MoÃ«t et Chandon, named its most prized produce after the master vintner. A bottle of Moet's Dom PÃ©rignon is inarguably unique. The wine is smooth, its bubbles are energetic but not distracting and there's an unmistakable aroma and flavour. The first Dom PÃ©rignon vintage dates back to 1921. Since then, only 36 vintages have been produced. So rare are these gems that a single bottle can fetch tens of thousands of dollars in an auction. No wonder then that winemaking is serious business here. 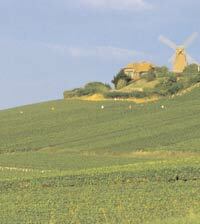 Most of Champagne-Ardenne's residents work in the wine industry. In fact more than 60 per cent of the land is dedicated to agriculture, with 280 sq km just to vineyards. However, to say that wine alone defines the region would be unfair. Champagne's largest city is Reims, which is home to the majestic Notre Dame Cathedral. This building's place in French history cannot be overstated. French monarchs travelled all the way over here from Paris for nearly five centuries for their official coronations. Reims is not just a historical landmark but also an important cultural centre. Music and dance shows are popular and held regularly, often taking place in the square right outside the cathedral's main entrance. If you can, plan your trip to coincide with one of these events. The square also doubles up as the town's shopping and entertainment hub. The streets are lined with Parisian-styled cafes and are a great place to spend a long, lazy evening. Of course, wine is the raison d'etre for every tourist's trip here. 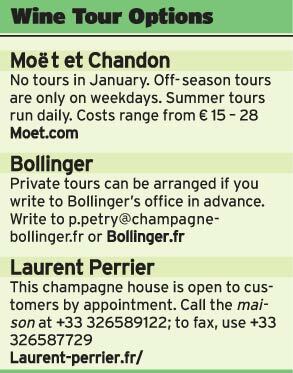 Champagne houses such as Bollinger, Laurent-Perrier and MoÃ«t et Chandon conduct regular guided tours that start in the vineyards where you're introduced to the three varieties of grape used in champagne: Chardonnay, Pinot Noir and Pinot Meunier. You're then taken to the wine cellars where grapes are crushed and processed. Once the champagne is fermented, it is bottled and left untouched for several months. 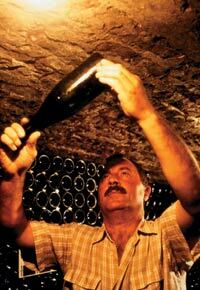 The liquid then undergoes a second fermentation in the bottle, producing those all-important bubbles. Temperature control is key, a guideline laid down by Dom Perignon himself. The chalky soil that surrounds these cellars lowers temperatures without the need for too much air-conditioning. The scale of the cellars is staggering. Laurent Perrier, the region's second largest wine house, has 27 kilometres of them. MoÃ«t et Chandon, the largest, has 48. The wine tours are frequently followed by a wine tasting. If you're planning to visit Champagne, you could either take the scenic three-hour drive from Paris's Charles de Gaulle airport or, if you prefer, hop onto the superfast TGV train. That journey takes just 45 minutes. Travelling in France can often be stressful and intimidating for those who rely only on English. Thankfully, the locals here are unfailingly helpful and polite despite their limited language skills. The warmth of the people, the glow of the mid-summer sun and the barely-there drizzles the locals charmingly call 'rain' are memories you will always cherish. If all you've ever done in France is hit the Champs Ã‰lysÃ©es for summer shopping sprees or dart through Paris on a transit, it's time for something new. Plan an intimate weekend in the Champagne region and be part of an unquestionably French experience.